The Elderville Lakeport VFD station 3 is located on FM 1716 just east of CR 2164 and West of CR 2166. It has Three Bays for fire apparatus, and living quarters. It was built around the same time that Station 2 was built and is very similar in design, only oriented differently and it has only three bays where station 2 has 4. We begin out tour of Station 3 with a view from FM 1716 Facing Northeast. As you can see there are three bays, and a the time of the photograph, Engine 4 (reserve) was being quartered in Station 3 as Engine 3 was having some maintenance done. Also you can see A-3 which is the offroad/wildland truck that is normally housed in station 3. As you walk in the front door, you come into the dispatch office. In here there is a computer with internet access and is tied into our wide area network for fire reports and file sharing. There is also a base station radio with an amplifier that powers the speakers inside the station. In here our reports and paperwork are done, and ocasionally when we need to dispatch a call it can be done from the dispatch office. Continuing into the day room, you can find a couch and recliners to be used after business hours to relax and maybe watch a movie. As we move into the Kitchen, you can see it is set up with a full size fridge and freezer, commercial gas stove, electric double oven, microwave, and of course a cofee maker. As we step out of the kitchen into the workout area. You may notice that it looks a little bare. There currently a nice treadmill in here, but we have recently purchased a weight training machine and are waiting to have a rubber floor installed to protect the floor, and provide a defined workout area. You might also notice the district maps on the wall as this is on the way out of the station into the engine bays. As we go down the hallway into the living area of the station we walk past the two bathrooms, we come to the bunk rooms. This is the view into one of our two bunk rooms in the station. 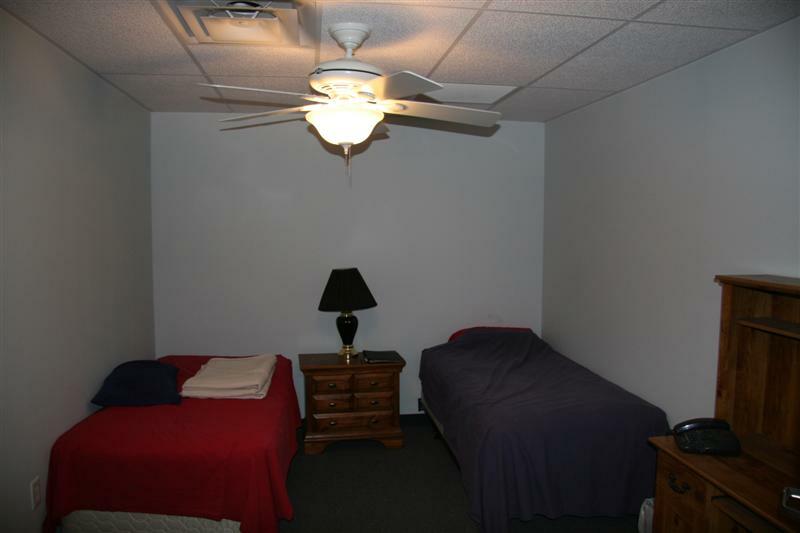 You will notice there are two beds, and a desk. It's pretty basic yet comfortable. There is a communications speaker in the room to alert occupants of a call.